Last Sunday (October 6) was World Communion Sunday. Prompted by logistical constraints, though perhaps serendipitously, we didn’t have a sermon. Or at least we didn’t have only one sermon. We asked a handful of members to share a story, or thoughts, or what-have-you based on the idea of Sharing at the Table. We also did something a little different (careful, there) with Communion. The table was decorated with textiles attempting to represent as much of the world as possible. The table held a variety of breads and grains available during the breaking of the bread. Christ shared so much over meals. He shared forgiveness over dinner with Zacchaeus. He looked sinners – broken and arrogant – in the eye and pronounced them whole. He broke bread with strangers, outcasts, alienated and alone. He changed them to friends, welcomed, and members of his body. 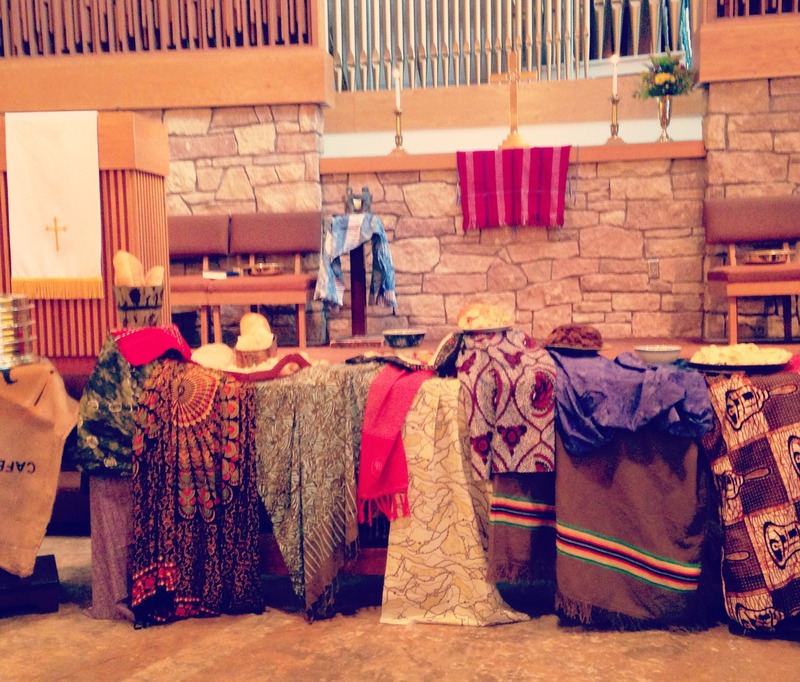 We celebrate communion differently today – in several ways. First, we will take the bread together in a few moments, and later in the worship, we will share in the cup. You will notice the table is covered in textiles and in cups and plates and bowls and many kinds of breads – representing our brothers and sisters around the world. We join with them today in celebrating Christ – his life, death, and resurrection – in our own shared meal – a meal we share in this place together, and a meal we share with those near and far. We celebrate the great spiritual mystery that out of such diversity, we may find communion in the common table of Christ. In a few minutes I invite you to come forward, row by row, and choose a piece of bread – from any of the options you see – and return to your seat. We will eat together once everyone is seated. The cup will be passed later in the service. Bless now, O God, this table, this bread, this meal we share together. Keep us mindful of those with whom we share this bread in spirit – down the street and in far-flung corners of our world. We celebrate the diversity of your world – from the rocky west coast to our own plains and prairies, to the warm sands of the East Coast. From the dusty desert of Africa to the tallest peaks of Asia. From the cobblestone streets of Europe to the outback stretching across Australia. We thank you that your hands created it all, and that you care for and love it all. With many tongues and yet one voice, we honor you in our thanks and our meal today. May this bread connect us more closely with you and in relationship with your children. Amen. This all started with the Presbyterians, this World Communion Sunday business. Sara’s story also changed my idea about communion. I grew up taking for granted that communion was for those who had passed through a specific rite – for those who somehow understood more than other people. Reading her book opened up a new appreciation of the mystery – after all, for those who venture to name communion a sacrament, we are essentially naming it a mystery – how is it we encounter the risen Christ in a simple meal. How is it that ordinary bread – and an ordinary cup of juice – can become for us more than literal food? Who are we to put limits or boundaries on the ways that God can reach human hearts, minds and spirits through the sharing of a meal?